Goa, a place where the eastern Konkan culture meets the western Portuguese culture, where each day starts with sun-soaked mornings and ends with beach parties until wee hours, is among the top spots on every travelers’ bucket list. Its unique blend of culture with modernity makes it attractive since generations for the tourists, not only in India but also from abroad. The delicious tangy Konkani curries with the appetizing Portuguese seafood makes it to every food lover traveler. Goa is located on the Western Ghats on the shore of Arabian Sea. It was a Portuguese colony until 1961, and is now one of the country’s best party hubs and is also featured for its World Heritage-listed architecture. Let’s explore the best places to visit in Goa, things to do and the best time to visit this amazing destination. Here is the list of best places to visit in Goa which you must visit on your trip. It is the capital city of Goa, which has a rich historical significance. If you are a history buff who finds peace amidst the historical buildings, then Panjim is the place to head to this vacation. 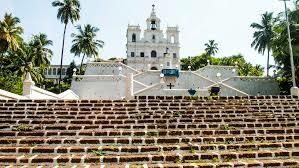 Panjim has a magnificent Church Square and municipal garden with the Our Lady of Immaculate Conception church originally built in 1541. Other historical monuments include the Adilshahi Palace which was built in the 16th Century, Jama Masjid, Mahalaxmi Temple and Portuguese style Institute Menezes Braganza. Another beautiful place not to be missed is the Fontainhas area which is an old Latin quarter and the closeby Miramar beach. If you are fond of flora and fauna, then Salim Ali Bird Sanctuary, situated in the nearby village of Chorão is not to be missed. Baga Beach is a popular tourist place in North Goa, which is located in Bardez. . It is very famous for it Baga Creek and has thousands of tourists visiting annually. If you are heading to Goa looking for some adventurous water sports, then Baga beach is the place you should head to. Baga Creek gives you the water sports experiences of parasailing and banana rides, it also has provisions for the Dolphin rides. Baga is well connected with the North Goa beaches of Anjuna, Arpora, Calangute. Calangute Beach which is located in the North Goa, is a famous beach among tourists, especially for its water sports such as parasailing and water skiing. Though the swimming and other water sports are prohibited during monsoon from June due to high tides. During summer and winter season, Calangute beach is largely visited by Indian and International tourists. Anjuna which is at a distance of 18 km from the capital city of Panjim, is a popular North Goa beach. Known for its serene ambiance amidst white sand, breezing palms and black rocky formations, Anjuna beach heads you to divine serenity. Every Wednesday, Ajuna hosts famous weekly flea markets which remains a main attraction for the tourists. Also, Anjuna beach is host to famous trance parties attracting young travelers from different parts of the globe. Candolim beach is one of the nearest beaches to the capital city of Panjim. It is a gateway to other North Goa beaches. A hub of amazing accommodations and restaurants, Candolim like other North Goa beaches offer water sports including parasailing and water skiing facilities. If you are looking for a peaceful and quiet vacation on the sun-soaked beaches and pristine white sand, then the Colva Beach in South Goa is the place you should head to. Among the tranquil beaches, Colva Beach has good hotels, resorts, discos, eateries, and restaurants far from the hustles of the crowd. Aguada Fort is a 17th Century Portuguese fort, on the Sinquerim beach in North Goa. It was built by the Portuguese in the defense from Dutch and Marathas, this fort serves as the jail in the present times. It has a 13 meters lighthouse within the premises. Aguada Fort is one of the best sightseeing places in Goa. Chapora Fort featured in the famous Bollywood movie Dil Chahta Hai is one of the best sightseeing places in Goa. Although the fort is left as ruins now, it offers some of the most beautiful views of the Arabian Sea coastline. One of the most alluring sights is the Dudhsagar Falls. It is a four-tiered waterfall where the water looks like foamy milk, giving its name Dudhsagar. Located on the Mandovi river, it is 60 km from Panjim on the Madgaon-Belgavi route. Dudhsagar falls is among the tallest waterfalls in India with a height of 310 m (1017 feet). This beautiful place is good for sightseeing but the basic infrastructure lacks, so one can just witness this beautiful place and return back. The nearest International airport is at Dabolim, near Vasco de Gama. It is well connected with domestic airports and international airports in the Gulf countries. It is well connected with roads and has two rail lines Konkan Railway and South Western Railway. If you are planning a trip to Goa, you must include water sports, sightseeing to some of the beautiful forts, hopping the local markets, partying in the beachside nightclubs, visiting magnificent churches, passing by Portuguese Quarters and dining at the local eateries for the Konkani and Portuguese delicacies, apart from soaking in sun on the pristine white sand beaches. The best time to visit Goa is between November and March, as it is very hot during the summers, and has a heavy rainfall during the monsoons when most of the water sports are prohibited due to high tides. If you want to see the best of Goa, visit during the Christmas-New Year season, to see amazing carnivals and the best beachside parties. New Year parties is very renowned and popular among the traveler circuit. For a more peaceful and quiet holiday, you can ditch the December and January months and plan it during November, February or March. It is very well connected from Bangalore, and if you are looking to plan a trip to Goa this winter season, then, Thripzel is there to plan an amazing trip or you. Feel free to contact us and know more about the trip .